The "Bucky Ball" design comes from the "32 tetrahedron" in manuscripts of 15th century astronomy and physics genius Leonardo Da Vinci. 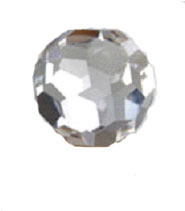 The "Bucky Ball" used for this essence is high quality quartz crystal that has been especially cut in Japan. The accuracy of the cut is also very high and requires a lot of skill to get the desired shape. The "Bucky Ball" has 32 facets which brings in the numerology of the numbers 3 and 2 (32), the number 5 (3+2) and the numbers 4 and 8 (4x8) to bear on the quartz crystal energy. This energy is ideal for focusing intention, initiating projects and making new starts. Works well with Shungite, which gently grounds and integrates efforts. 2. This stunning blue and silver-coloured stone creates deep fast flows of energy to bring peace. Very protective, stabilise and aligns subtle bodies and chakras. 3. Eases congestion in the 2nd chakra and creates easy flow of energy through chakras 1-3. Works well with feminine energy during times of stress, bringing issues to the surface to be looked at witrh a calm and detached mind. 5. Grounding and anchoring strong emotions to create security and feelings of safety and strength. Gently warming and energising, opening the heart to explore the world from a position of inner harmony. 6. Powerful, all-level healer, activates, integrates and stabilises energy. Eases left/right imbalances throughout the whole system. 7. Expansion of consciousness in a safe, grounded environment. Clarity in the brow chakra aiding perception and clear envisioning. Subtle bodies brought into alignment. 9. The high frequency energy of this violet coloured Scapolite is ideal for those wanting clarity with fine levels of communication. Shifts stagnant energy and blocks to reaching full personal potential. 10. Silver is works on fine levels of communication, thinking and perception. Linked to lunar energies, it helps to balance male/female polarity in behaviour at all levels of being. Enhances all functions of the 2nd, 3rd and crown chakras.